The potential utility of adult stem or progenitor cells for repair of radiation-damaged salivary glands is high, but is currently only a theoretical solution for patients suffering from xerostomia. There remain several critical obstacles that must be resolved before cell-based therapy for dysfunctional salivary glands can be moved into the clinical arena. These include the identification of appropriate donor cells, the technology for promoting implantation, and direct functional assays to assess the outcomes. We propose to address these issues, using the powerful and well-defined genetic tools available in mice for tracing cell lineages, and cell types. A dissociated cell prep prepared from whole submandibular gland was seeded into PEG hydrogels and incubated in serum-free media. 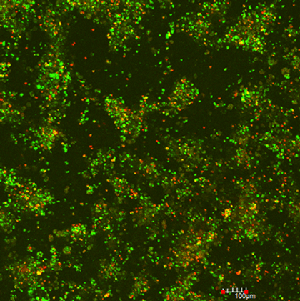 At 7 days, samples were stained using a 2-color live/dead assay kit (Invitrogen), and imaged by confocal microscopy. Viable cells are green. Dead cells are red. In combination with tunable hydrogel scaffolds, we will use known salivary gland progenitor cells to determine environmental and cellular cues required for their differentiation in vitro and in vivo. The hydrogels will be used to transplant cells into two opposite environments: regenerating atrophic glands, and damaged irradiated glands. The goal is to determine if the use of hydrogels can promote in vivo differentiation of transplanted progenitor cells. The successful completion of this project will establish a foundation for subsequent translational research to progress the technology into clinical applications. 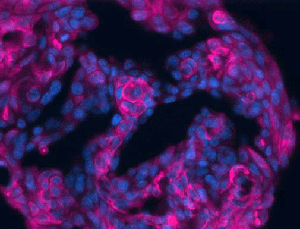 At 7 days, PEG hydrogels were fixed, sectioned, and immunostained for nuclei (DAPI) and keratin 5, a marker of salivary progenitor cells.